Google Forms are an excellent way to collect, collate and interpret large sets of data. Many of the existing templates in Google Forms have already been set up to report the results the second they are finished. We have used them at our school as multiple choice tests and within seconds the students have been sent a copy of their results with averages, means and standard deviations. You can use them to collect names as a sign on sheets, parent teacher night interviews and so on. Have a look at the great google doc below for some other interesting ways of using them in your classroom. I have gone Google Forms crazy! I don't know of any other one tool I love more. At the end of the school year, I had a teacher ask me for suggestions on what she could use for an activity she has her students do at the end of every year that would save her time. She always has the students write a positive comment about everyone in the class, then she compiles and copies them to gives everyone their notes on one page. I suggested Google Forms. We used the template with the spilled glue and I titled it Mrs. Garippa's Class Sticks Together Like Glue. (She actually had 4 classes of about 100 kids total.) It took about an hour to set it up and then to format the spreadsheet so that each student's comments printed on one page. The teacher loved it as did the kids. Thnx for the beautiful comment Ann. 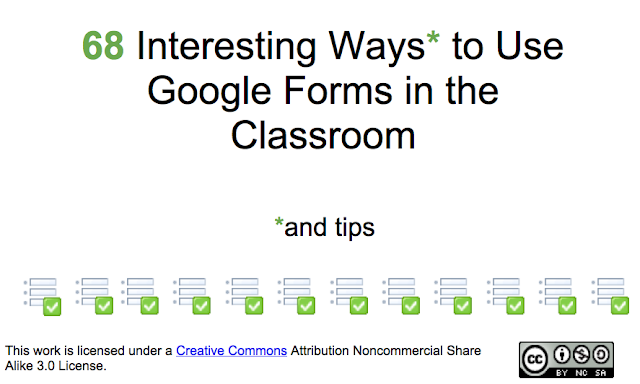 It sounds like you had as much fun introducing Google Forms to your colleague as they did using it. The energy and enthusiasm you have for introducing people to appropriate technology is inspiring. I hope your comment gives others the confidence to give a new web tool a go. Follow the basic Runescape 07 Gold via copenhagen-dating.dk the web page and obtain your loved one. Are going to just as well very happy to aid.Source for this Buy RSGP. The main Find News benefit of achieving this, obviously, Gw2filed is that you simply will not waste time and funds in non-critical pitfalls while leaving behind objective crucial pitfalls out of hand.The risk investigation should at least include the four major places which usually all businesses are reliant, particularly:A single.